All your EazyEFT data is contained in a single database file. As long as you have an up to date copy of this file then everything is recoverable in the case of catastrophic system failure. That is why it is of the utmost importance that you back up your EazyEFT data file regularly. If you currently have EazyEFT installed and working standalone on a single PC then please see Section 1 below. If on the other hand you have EazyEFT installed on our company file server and it is currently being accessed by one or more client PCs then please see Section 2 instead. 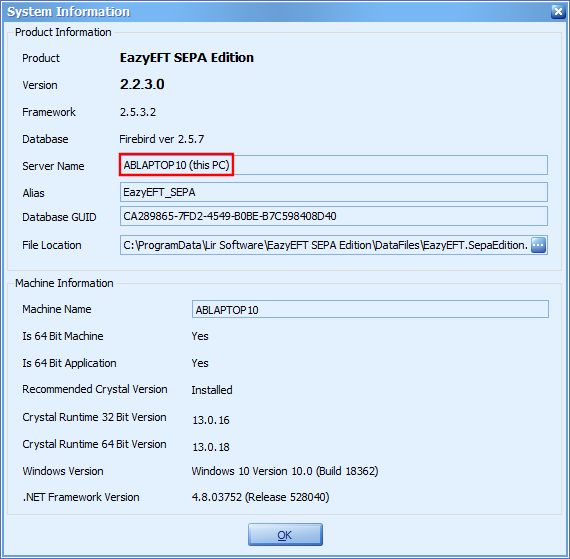 If you are not sure whether EazyEFT is installed standalone or whether it is installed on your server then there is a quick way to check. If you can run and log in to EazyEFT as normal. Then click on Tools >> System Information in the Utilities section. If your PC name is displayed (as shown below) then EazyEFT is installed standalone on your PC and you should refer to Section 1. If on the other hand your company server name is displayed, then your EazyEFT data resides on that server and you should refer to Section 2. If you have a file server within your organisation, then we highly recommend that you install your EazyEFT data file on the server (if you haven't done so already). The reasoning behind this being that most organisations religiously back up their servers every night, but very rarely (if ever) back up the individual client PCs attached to the server. Even if you only have EazyEFT running on one single PC, as long as your entire server is being backed up every night then so too is your EazyEFT data. This means that if your PC dies or if you want to replace your existing PC then you would only need to do a Network Install Client on the new PC and point it to your existing data on the server and you would be back up and running in 5 to 10 minutes. If you currently have EazyEFT installed and working standalone on a single PC and you would like to move it to our company file server, then please see Installation Guide #6 on our downloads page. If you do not have a file server and you only have EazyEFT running on one single PC and you are not running any backup software that backs up your entire PC, then you need to ensure that you regularly take a copy of your EazyEFT data file. Before you begin, if you are still logged in to and running EazyEFT, then please exit the application. Once you are out of EazyEFT, the file you are looking for is called EazyEFT.SepaEdition.Data.fdb and by default it will be in a 'C:\ProgramData\Lir Software\EazyEFT SEPA Edition\DataFiles' folder on your PC. Note : In the unlikely event that you are still running Windows XP, then you will not have a 'C:\ProgramData' folder. Instead the file should be in your 'C:\Documents and Settings\All Users\Application Data\Lir Software\EazyEFT SEPA Edition\DataFiles' folder. The 'C:\ProgramData' folder is normally hidden and may not be visible when you try to browse all the folders on your C: drive. If this is the case then simply type 'C:\ProgramData' in to the top of the Windows Explorer address bar (as shown below) to show the contents of this hidden folder. Once you have browsed to the appropriate 'DataFiles' folder, you can now copy the EazyEFT.SepaEdition.Data.fdb file to a USB key or to an external hard disk. As with all backups, it is highly recommended that whatever device you copy your file to, that this device is taken off site every night. What About Dropbox, Google Drive, OneDrive etc. ? Instead of copying their EazyEFT data file to a USB key or external hard disk, we do have customers copying it to their personal cloud storage (e.g. Dropbox, Google Drive, OneDrive etc.) Whilst the most popular cloud storage options have a high level of user friendliness and convenience, they are prone to attacks from hackers who try to expose files and passwords and they have been highly criticised in the past for not protecting their users’ information. Lir Software therefore advise that you make your own informed decision as to how secure your particular cloud storage is, before you even consider using it to hold a backup copy of your EazyEFT data. If you have EazyEFT installed already on your company file server then please check with your IT department (or whoever looks after your server) that a) your server is being backed up nightly, and b) that your EazyEFT data file is included in this nightly back up. The file that they are looking for is called EazyEFT.SepaEdition.Data.fdb and by default it will be in a 'C:\ProgramData\Lir Software\EazyEFT SEPA Edition\DataFiles' folder on the server. Note : If your server is running Windows 2003 Server (or earlier) then it will not have a 'C:\ProgramData' folder. Instead the file should be in 'C:\Documents and Settings\All Users\Application Data\Lir Software\EazyEFT SEPA Edition\DataFiles' folder. If for whatever reason you need (or you think you need) to restore a previous back up, then please contact us first. Do NOT copy on a previous data file without contacting us first. SEPA XML files have strict rules in relation to numbering (e.g. UMRs, Message IDs, Batch IDs, End to End IDs etc.). Whilst EazyEFT knows and adheres to these rules, if you just copy on a previous data file then EazyEFT will have no way of knowing what has gone before and you run the risk of files failing to upload to your bank, transactions bouncing inexplicably etc. If you contact us first then we can advise accordingly. Though not absolutely required it is also a good idea to backup your EazyEFT output folder. This is the folder where EazyEFT creates the files that you then upload to your bank. Unless you have deleted or moved files, it will contain a complete history of all your previously created files. If you are unsure where your output folder is run EazyEFT and click on Company Maintenance in the Set Up section. The output folder will shown as highlighted below. If this output folder points to a shared folder on your file server then as per Section 2 above, you should check with your IT department (or whoever looks after your server) that this folder is also included in the server nightly back up. If this output folder is a folder on your local PC, then we would recommend that you also copy this folder (and all its files) to your USB key, external hard disk or personal cloud storage when backing up your data file as per Section 1 above.